Researchers in Oregon have concluded, after extensive research, that prey species have a fear of predators and that prey species move away from their mortal enemies in an effort to survive. They have also concluded that this natural system has an important relationship to the success of other plant and animal life. Interesting how a bit of research can lead to statements by politicians who are too eager to use science as a basis for social sculpturing. In our local paper (on a front-page feature article no less) Tri-Valley Herald reporter Suzanne Bohan uses the research to support her own conclusions. What’s wrong with this? From what I see, the research related to this subject is most applied to wolves. There are and have never been wolves in Yosemite. Bohan then goes on to apply the “Fear” theory to mountain lions. Then she concludes that we don’t have enough of them and we need more lions in the park for the benefit of botanical success. Horse poop. 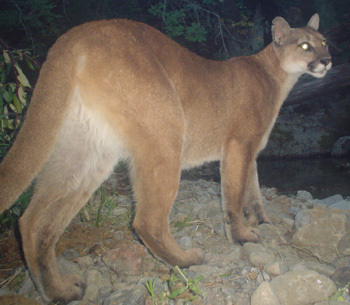 Mountain lions are at equilibrium in California. Our habitat cannot support any more mountain lions. If you want to save the flora and fauna of Yosemite Valley, remove the tourists. They are what keeps the mountain lions away. Lions don’t like people. Lions do move deer around and it is a benefit for the ecosystem. Human hunters do the same thing. After removing the tourists, we can then insert human hunters to assist the lions. The result will be a much improved Yosemite. On September 11, 2001 Rob and I were packed and ready to fly to Fairbanks. As we approached Oakland Airport, we came to realize that our trip would be delayed. It was four or five days later that we finally boarded a different plane and flew to Fairbanks. Our trip was to be a self-guided archery moose and caribou hunt along the Alaska pipeline road to Prudhoe Bay. We outfitted ourselves and rented an SUV in Fairbanks. A day of driving later we crossed the Yukon River and headed into what seemed like no man’s land. 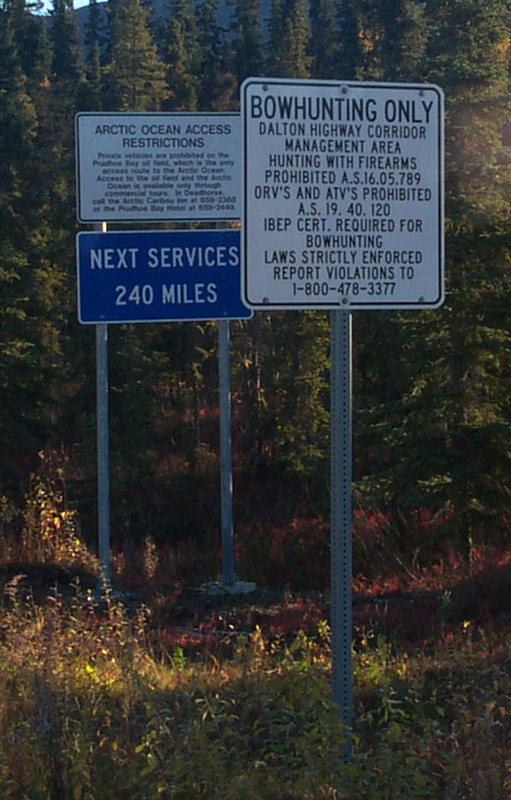 Archery hunting is permited along the haul road, but rifle hunters must travel 5 miles to be legal. 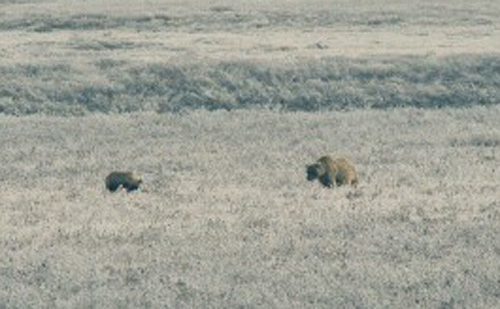 Along with sheep, musk ox, caribou, moose and black bear we observed several grizzly bears along the way. 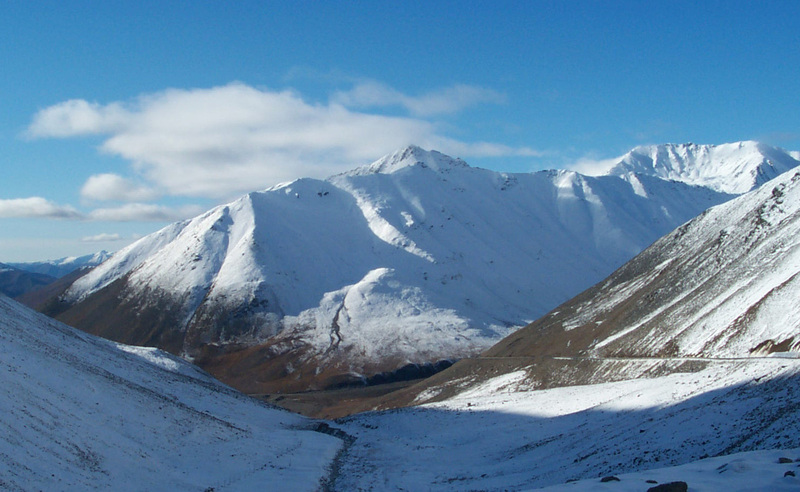 The Brooks Range was quite scenic. The pipeline was sometimes an impressive sight. This is the North slope. We camped at the Arctic Circle and had lunch the next day in Coldfoot, supposedly the coldest place on the North American Continent. We finally found some caribou to hunt after passing the Brooks Range and arriving at the North Slope. We hunted caribou for a few days and had some close encounters, but failed to get off any shots. Since our trip was cut short by 9/11, we didn’t have long before we needed to head south to the Arctic Circle to hunt moose. 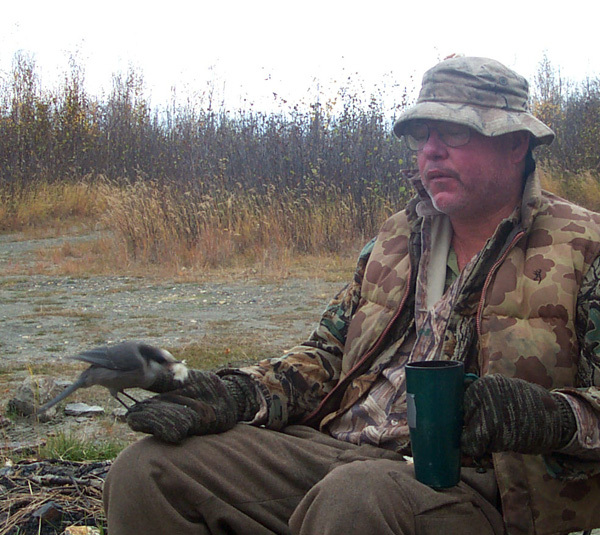 While camped at the Arctic Circle, Rob fed this gray jay. Unfortunately, the unseasonably warm weather precluded typical moose rutting activity and we went home without seeing a single bull moose. 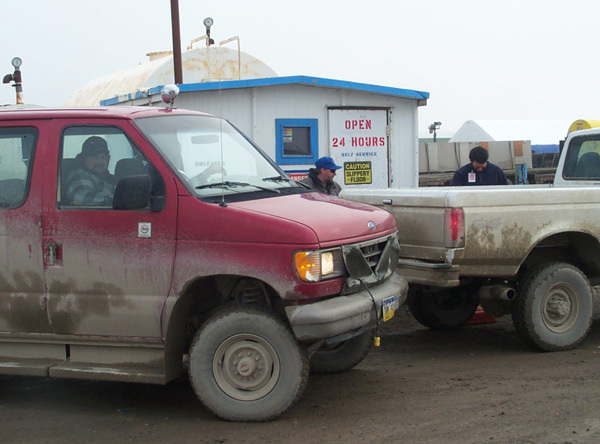 This was the Prudhoe Bay gas station where we filled up. Next gas, Coldfoot, a few hundred miles south. 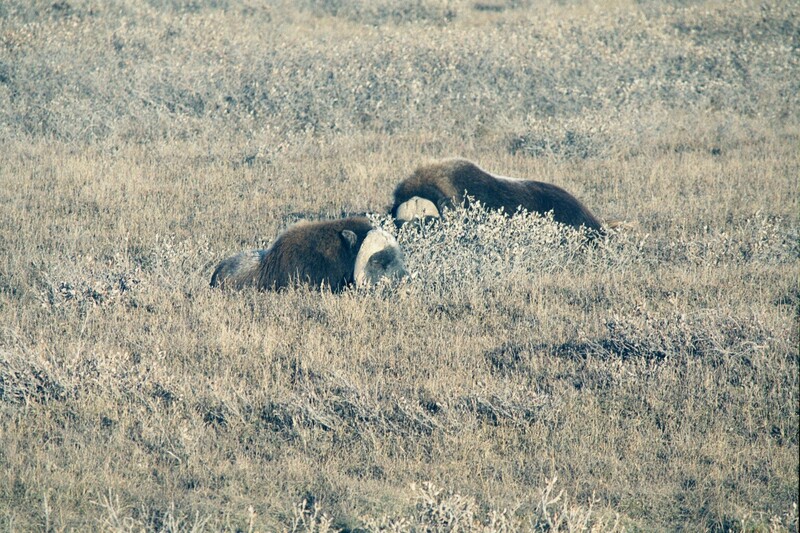 Musk ox sleeping a few yards off the haul road on the North Slope. While archery hunting for mule deer in the Hoover Wilderness in 1991, I noticed that the well-warn trail leading into the hunting area was littered with animal tracks each morning only to be erased by human travelers during the day. 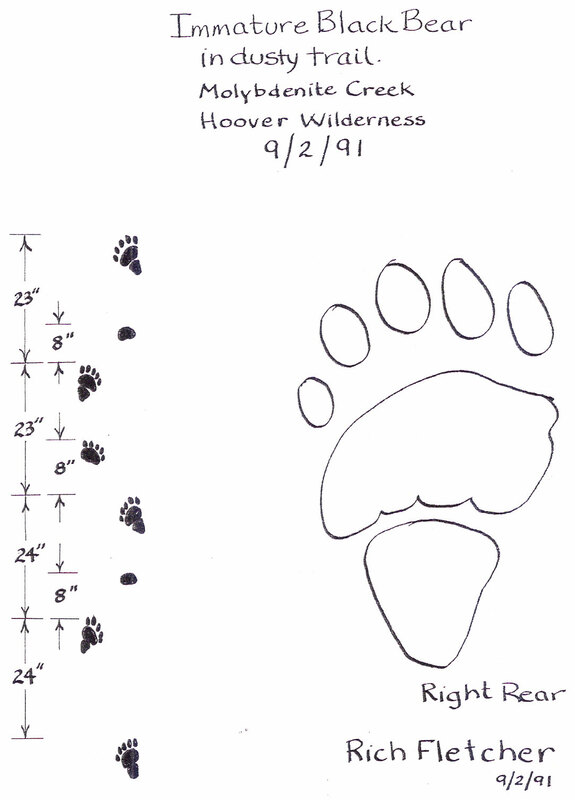 One morning I arose early and took a few minutes to observe, measure and sketch a beautiful and perfect pattern of black bear tracks in the deep dust of the trail. Carrying a notebook, pencil, tape measure and string is what one needs to make an accurate record of tracks. I keep these items in a ziplock bag when I’m in the tracking mode. Note that when the black bear walks he moves one side of his body and then the other as is the case with other wide-bodied animals like porcupines, beavers, wolverines and raccoons. This is his primary mode of travel, but when he shifts into high gear, his gait will change to a lope or a gallop. 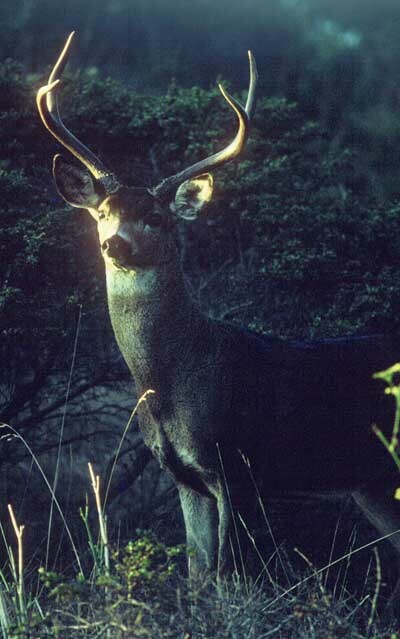 SB1172 creates California Fish and Game Commission oversight over expenditure of funds generated from sale of all tags and stamps issued for take of big game animals in California including funds generated from Fundraising Tags, deer, elk, bear, sheep, antelope and pig tags as well as upland game bird stamps. This video shows the testimony of Senator Dutton who authored the bill, Mark Hennelly of COHA who sponsored the bill and various conservation organization representatives who testified on behalf of the bill. Since this hearing the bill has passed through the Senate and will soon be tested in the Assembly. 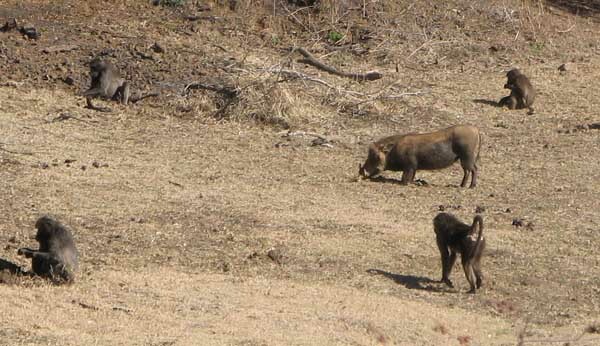 Warthogs and baboons feeding at Pillainsberg Wildlife Refuge near Sun City South Africa. Although not considered high on the list of African trophy animals, warthogs are a very significant animal for several reasons. First of all you’ll see them often. They are interesting to watch and strange looking with their large tusks. And, they are fun to hunt. While we stayed at the Nagala Camp, warthogs would occasionally roam through camp. The first video is a clip of a large warthog as it grazed in camp. Note how it feed from its knees. The second video is a clip of a warthog I killed at Sitatanga Safaris. It is one of the two animals (both warthogs) I was able to bag while still hunting with my bow. Hunting from a blind over bait was more effective, but still hunting was the most fun and more satisfying. You will see that this was an enclosed ranch and it wasn’t large, only a few hundred acres, but the fences played no role related to the warthogs as they were frequently observed crawling under the fences. I started the hunt at first light, not far from our camp. I spotted this pig about 60 yards away standing very still and broadside from me. At first I thought that he had seen me, but stepping back behind a bush, I was able to slowly approach to thirty yards. At that range I decided to shoot and hit him, but it didn’t appear to be a great location. Off he went and it wasn’t until later in the day that we recovered him after a trail of about 300 yards or so. The South African speaking in the video was my professional hunter Kobus Grobler – a fun guy to hunt with. On December 1, 2007, Tom Billingsley and I sat in camp and watched the geese lift off. I related this on an earlier blog. Recently I uploaded the short video I made right after the geese lifted off. Even though many, if not most, of the geese had already flown, you’ll get the idea of the goose numbers that were packed onto Webb Tract that weekend. Check it out. The quality of this video is very poor, but you’ll get the idea of what was going on that day if you watch. While in South Africa, we spent three nights at Nagala Tented Safaris. 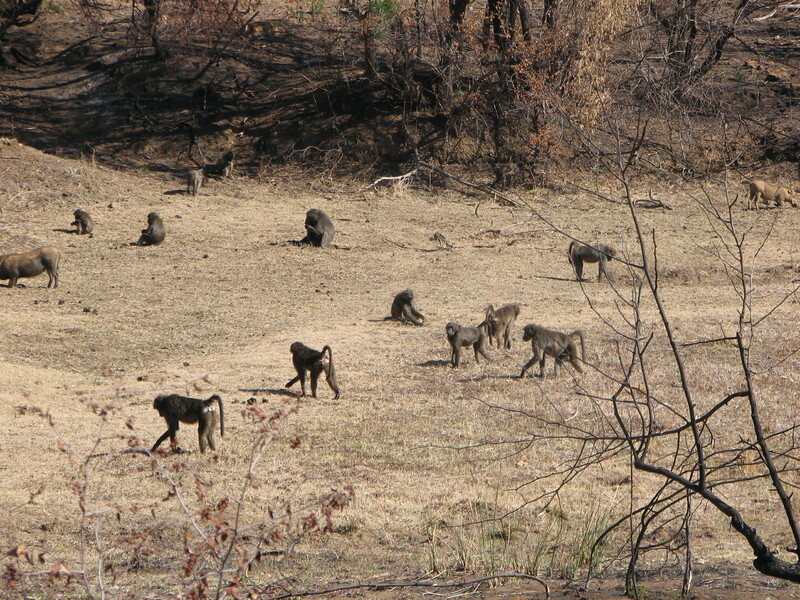 The camp was located in the bush and we had wart hogs and bushboks feeding right in camp. In fact, there was no fence so any animal could potentially walk through camp, except the elephant. To keep elephants out, an electric wire was strung about ten feet high around the camp. One of the exciting moments we experienced while viewing wildlife at Kruger Park was watching a male lion roar from a distance of about ten to fifteen yards. The roar was quite loud. I don’t think the video does it justice. The lions roared each night, apparently keeping track of their buddies. One night the lions roared very close to camp and one lion seemed to pass by within a couple hundred yards, but we could hear them for miles as well. Apparently the lions keep track of their pride by roaring, but they also may be searching for female lions in other prides that are vulnerable to take over. If a male lion takes over a pride, it kills the cubs, so females with cubs often band together in groups (prides) so they can defend their young against intruders. Lone female lions with cubs will avoid unknown male lions, as a single female lioness is less likely to be able to fight off an intruding male lion than a pride with several females.